Today proves to be more active than yesterday in the loyalty world! Hilton HHonors' latest hotel award night category changes are out. No changes here in Canada other than two new hotels being assigned their categories. The Hampton Inn by Hilton Timmins and Hampton Inn by Hilton - Ottawa Airport are both Category 4 hotels. Globally we see 2 hotels go down a category and 18 go up. These changes take effect on July 8. Find out more here. IHG Rewards Club has launched a summer redemption sale - on merchandise rewards. You can save 15% on a selection of merchandise in their rewards catalog. As is usually the case with merchandise, even with th 15% off, it is not that good of deal. We usually say the only people who should jump on this are either those who have too many points and don't know what to do with all of them or those who don't have enough for a reward night stay. That being said, with IHG PointBreaks being only 5,000 points per night that last tip doesn't really hold true for IHG Rewards Club. Find out mere here. What do we feature here every Wednesday? KLM's Wild on Wednesdays offer! This week the destination is Lagos. 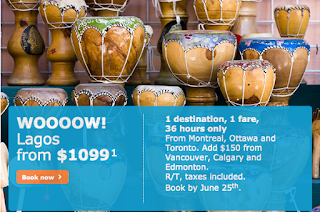 Fly there from as little as $1,099 all in. Book by June 25. Find out more here.